This bright and refreshing mocktail is made with tons of great ingredients with great health benefits. 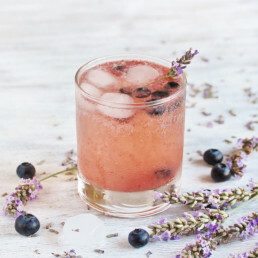 Lavender can help fight stress, reduce headaches, improve sleep, and so much more, while lemons contain more potassium than apples or grapes, and blueberries are full of antioxidants! Bye bye alcohol, hello alkaline - nutrition for healing from alcohol overuse.